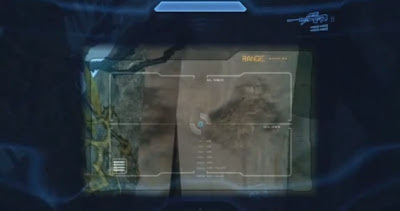 Gears of Halo - Video game reviews, news and cosplay : Where are Halo 4's easter eggs found? You know what an easter egg is right? No? In gaming terms and Easter Egg is a nod of some kind, a hidden message, an in joke or reference. Bungie placed eggs in all of their Halo games, the most famous perhaps being a piece of music called The Seige of Madgril' which can be found when standing in certain, out of the way locations. Here's what 343 Industries put into Halo 4 and how to find them. As you first land on Requiem, you will come across a crash site of Covenant Cruisers. If one keeps to the left long enough one will find the way out. Those who chose to explore the site are rewarded with an audio log of Dr. Catherine Halsey discussing the inevitability of A.I. rampancy or rather how perhaps Cortana might be able to over come the issue. Halsey was the lady in handcuffs at the start of the game - she's the one who created the Spartan programme. Check out this youtube video to hear Halsey speak. After the Master Chief exits the covenant crash site and steps into the sunlight, a mountain path littered with Warthogs extends out to the left Look to the right instead - edge of the cliffs stands an outcropping of rock with a rather unusual tree and a metal framework. Manoevure to the lower ledge at which point you may look up at what appears to be a series of burn marks across the structure. You'll see what could be a Spartan portrait. Following completion of the first section of the ‘Reclaimer’ mission, the Mammoth will traverse a river nearby a waterfall. When the Mammoth halts, check out the double rainbow. Conan did some early promo work for Halo 4 - an no wonder as he managed to get himself included in the game. On the Shutdown mission, Conan can be found as a soldier chatting about being in the military in the UNSC warehouse. The other soldier is Andy Richter. I took this picture with my iphone in a dark room so the quality is poor. On the FUD, check out the floor in the area where the Covenant board - you'll spy in the floor a copy of the Collector's edition of Halo 4 - that's very meta. Sergeant Johnson Egg on Shutdown level. This is the dude and it doesn't look like Avery. At all. If you kill a lot of marines in the hanger bay that houses the Pelicans, eventually a black marine will spawn. Some claim this is Sergeant Johnson but frankly it looks nothing like him. Halo 3 Launch Trailer - note haven't checked this one out yet. In the prologue cinematic there is a brief shot where the Master Chief takes down a Brute Chieftan. That is apparently following on from the end of the Halo 3 launch trailer where Master Chief jumps into a pack of heavily armed Brutes. Level Artist for the Halo series, Vic Deleon placed a few scratched out 'V' into the Sniper Alley Spartan Ops mission. 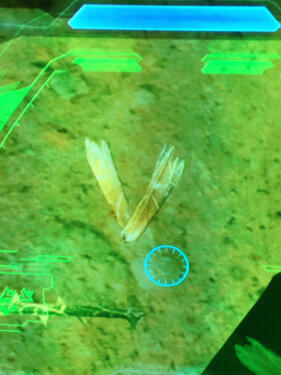 The V is presumably his initial. Follow Vic on twitter here.